If you were using SocialBlade.com to track your Instagram growth, you must have been devastated when Instagram depreciated their old API overnight, preventing third party providers like SocialBlade from tracking your follower and following growth. Fret no longer. Here is a simple solution to build your own Social Blade on Google Sheets, with a Google Sheet template you can copy. 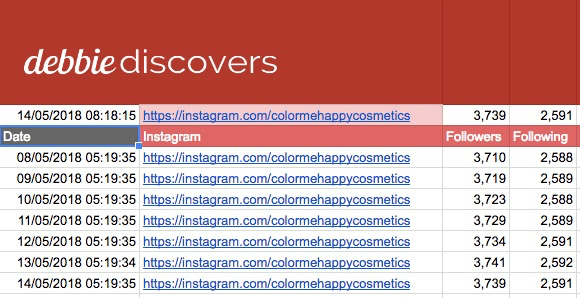 The sheet called “Instagram” uses Google Sheet formulas (specifically ImportXML and REGEX) to extract your follower and following numbers from your Instagram URL. The sheet named “Dashboard” tracks your followers and following number, and calculates the absolute and percentage change. The followers and following number is pulled in from the sheet called “Instagram”. If you have more than 10K followers, your Instagram URL will show an rounded up number, to the nearest thousand 10.0K, 100K and 1M so your numbers will not be as accurate. Enter your URL in B3. DO NOT TOUCH the formulas in C3 and D3. You should see your followers and following numbers extracted into the next two cells. In order to create a self-updating dashboard, you have to activate the Google Apps Script that I wrote. The script does two things – 1) it saves a new row to the spreadsheet with your data, 2) it allow you to create a time-based trigger to automatically append a new row every day. 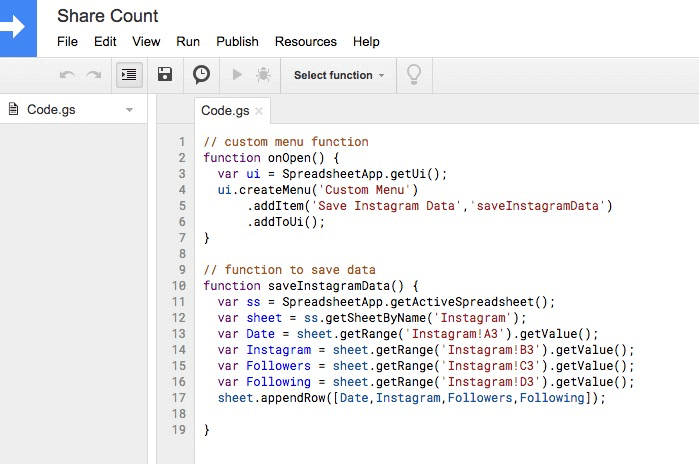 To run the Custom Script – go to “Custom Menu” and hit “Save Instagram Data”. This will append a new row to the spreadsheet, and fill it with whatever data is in row 3. But first you have to authorise the Script. Ignore the warning, the script is safe because I wrote it (and am making it open source so you can verify that it’s safe). Click on Advanced. 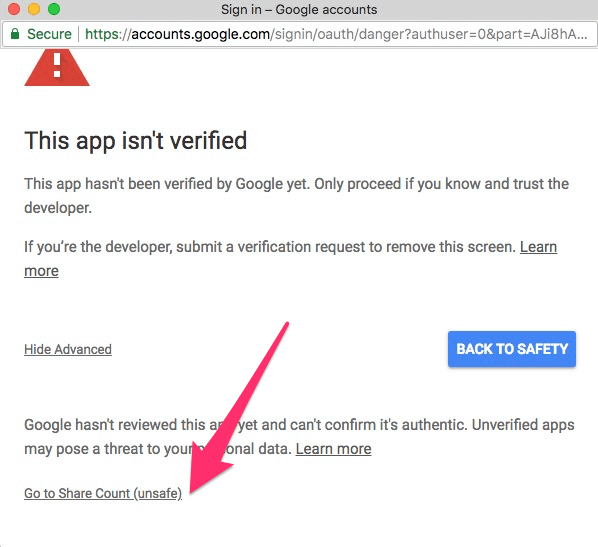 Click on Go to Shared Count (unsafe). 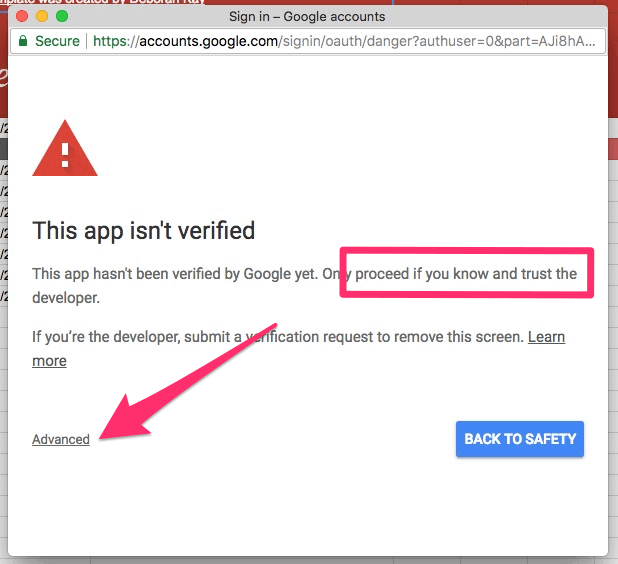 Allow access to your Google account. 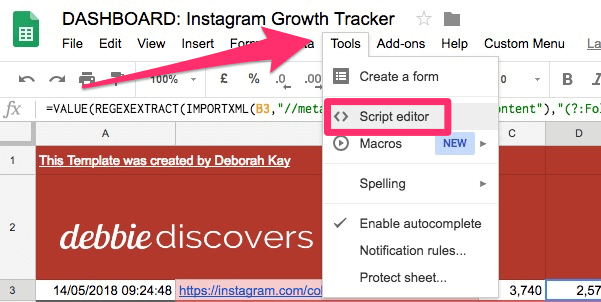 This is required in order for the script to run on your Google Sheets. Revoke it any time. Once the script has run, you should see a new row created each time you click the “Save Instagram Data” button. Here, you’ll see the script that I wrote. 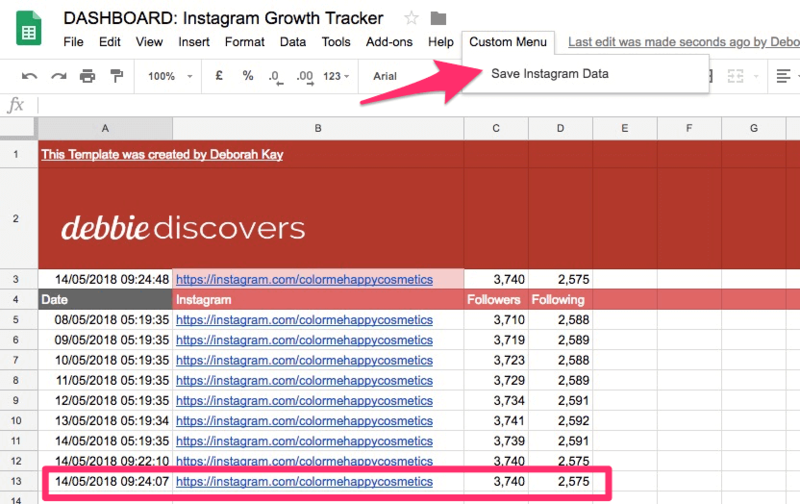 In layman terms, the script creates a Custom Menu with an option to Save Instagram Data, such that when you click on it, it gets value from the relevant cells in the sheet named Instagram, and appends a new row). Simple! Please note that if you rename the “Instagram” sheet, or if you move the cells around, you will have to modify this script accordingly. You can also modify this script to track more than one Instagram profile. To set the timer, click on the Clock Icon in the menu bar (next to the Save icon and the Run icon). Or go to Edit, Current Project Triggers. Set a trigger for the script to run every day between 5-6am. To check that you’ve set it up correctly, head over back to the “Instagram” sheet and hit Save Instagram Data 5 times to test it. It should have appended 5 new rows. Head over to “Dashboard” to check that it has pull the data over. In this sheet, I’ve used QUERY and ARRAYFORMULA to make an automated SocialBlade-esque dashboard. If it works, you can delete all the data, hit “Save Instagram Data” to save the first row, and you’re all set! Check back tomorrow to see if the spreadsheet has automatically updated. If you want to know how the formula works, I use IMPORTXML and REGEX formulas to extract the follower and following number from any Instagram profile (works on public profiles even if you’re not logged in to Instagram). If you want to see where it’s pulling the number from, head over to your Instagram account and look under the hood (right click and “View Page Source”), search for “Followers” and you’ll see that we’re pulling it from the meta description. These are the same numbers that show up on your public profile. This Google Sheet alternative to Social Blade is quite easily adapted to track Twitter followers / following as well as Facebook Page Likes. I have mine tracking 23 accounts. In fact, it can track almost any social media statistics. To learn more, visit Ben Collin’s website which shows you the formulas you need for the other platforms. If you found this useful, do leave a comment below, and share it on your social channels!